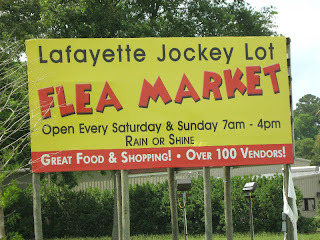 There is one thing that I know for sure and that is I love flea markets. I love the great deals on stuff that you never thought you ever needed. And if you go to a flea market you will find something that you will just have to have. I have a favorite flea market. It's not too far away or too large. There is a really awesome flea market in Texas that you have to sleep in a hotel and spend four days just walking from vendor to vendor. Which, someday I will do, but for now this little spot will just have to do. 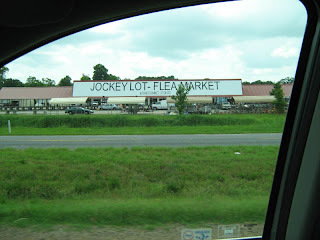 It's called the Jockey Lot. It is only opened on Saturdays and Sundays. I don't go shopping on Sundays, so that leaves me with just Saturdays. And with rodeos being on just about every weekend, I jumped at the chance to go this past Saturday. I am sure glad I went. A lot has changed at the Jockey Lot. The last time I went they had two really large wings and another outdoor wing that didn't really have any vendors in it. This time when I went there were four wings and a lot of vendors. I was so excited. The boys were excited too. Little Cowpoke kept asking me if we were going to find any space ships. 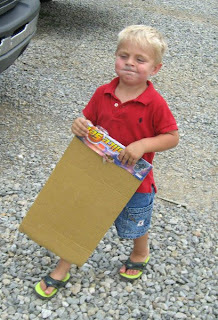 I told him that you never know what treasures you will find at a flea market. And treasures there were. The main reason I go to this flea market is because of the pots. You can see where the pots are in the back? There are about three more sheds of them. And they are cheap too. Last year they were a lot cheaper, but I guess gas was cheaper last year too. 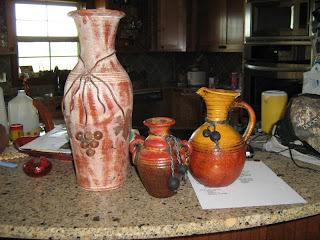 This lady drives to Mexico and gets all kinds of pots. I love those pots. Here are the ones I picked up this time. These are the smaller ones that I got. I do not like the one on the left, the tall one. It doesn't go with my kitchen colors. 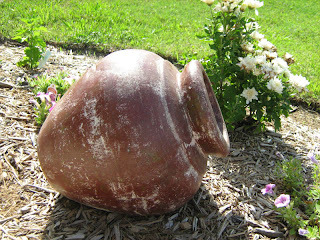 I had bought some pots like it last year and they were darker like the smaller two pots. The pots are what I have all above my kitchen cabinets. 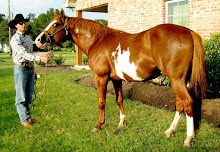 So, the new tall one will go to the rodeo club to be auctioned off. It will find a good home I am sure. I know this is not a pot, but he is made of the same stuff. Little Cowpoke picked him out. I am not normally a big fan of small stone creatures in my landscaping, but he was cute. And he will keep the dogs from laying on my flowers. Big Cowpoke picked out the baby bunny. He said is was so cute. There were bigger ones but he wanted the small one. So, this small bunny is guarding the bushes. And I guess the bright green sunglasses too. 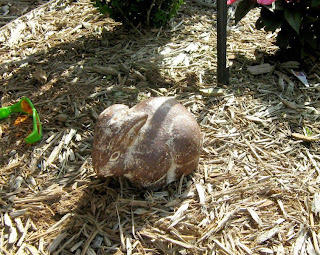 Maybe I should be more concerned about toys in my landscaping and not stone creatures. This one is my favorite. There were only three left and I about pushed another lady down to get it. I can be a bit mean when I am buying pottery. I am not sure what I am going to put inside this pot but it needs something. I don't want frogs and snakes finding it and making a home of it. But isn't it pretty? Then I got another one of these. Last year they were 10 dollars, this year the price went up a bit. But I needed another one. I was going to put it where the turtle now is living. So, now it needs a new spot. I am sure I will be able to find one. Those were the pots that I found. The lady has so many more. These were just the ones I picked up this time. I am so bad. Don't tell Mr. Cowboy. Then the boys found a vendor that had all sorts of toys. They had the cutest guitar that was kid sized but looked like a big guitar. Big Cowpoke really wanted it. 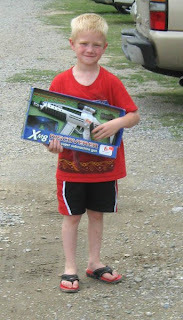 But then he found a play gun that vibrates and makes shooting sounds when he pulls the trigger. So, no guitar. Little Cowpoke picked out an entire set of military stuff. He mainly wanted the gun. What is it with boys and guns. It really wasn't that heavy, but I guess after dragging it around all day, it might get a little heavy. He was so excited. Big Cowpoke was so excited too. He was pulling the trigger here. I guess he thought you could tell it vibrated and made sounds in the picture. Let me tell you it was a noisy car ride home. But they are continually protecting me from all the bad guys. The spiders, wasps, and the pesky German Shepherd dog from next door. Oh, and now for my favorite finds. 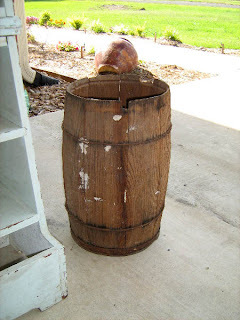 I got this barrel to put at my front door for umbrellas. Because we use our front door all the time and we always use umbrellas. I was thinking that I needed to buy some umbrellas just to stick them in the barrel. But isn't it fun? Then the next item. 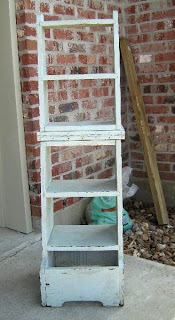 This is a shelf/end table. The lady told me it was a step stool, but I don't think it is. I am not sure what it is. But it's so cool and chipping paint. Here it is folded down. I am not sure how I want to use it yet, but it's going in my bedroom. I love it. I think I may use it to display some pictures and things in the corner. But I will have to clean my room first. This will be incentive to get cleaning. We had such a fun day at the flea market. I can't wait to go back. I am sure Mr. Cowboy can wait until I go back. I tried to get a quick picture on the way out. And yes I was driving, but I wasn't looking at what I was taking a picture of. I just pushed the button a few times because I was getting onto the interstate!! I know my Dad is just dying right now. Sorry. I have a bad habit of taking pictures and driving. There was one more place I wanted to stop at before going home, and that was the Cowboy Store. It's this way cool home furnishing store that is all western rustic stuff. I love it and wished it had been opened when we had built our house. I drove up and found out it was closing and having a 40% off sale on everything in the store. So sad they are closing, but yeah a sale. This is what I got. The sign and the picture frame were dirt cheap. I was so excited. Then there is that bronze statue. It's the "Easy 88" by Montana Silversmith. It was just sitting there with no price tag and the man working the counter told me it was $60. Yeah, and on sale!! How cool is that? That is going to be Mr. Cowboys father's day present. I am so excited. The boys were so excited. Those thing are normally so expensive I just drool over them. But now I have one. Mr. Cowboy is going to love it. I did get one more thing but the lady had to make me a special order and I will show that to you later. We had fun at the Flea Market. When we got home, we got a quick bite to eat and then headed over to meet Joe the Goat's family. I will tell you all about that tomorrow! It was so much fun!! Until next time, y'all come back now ya hear! 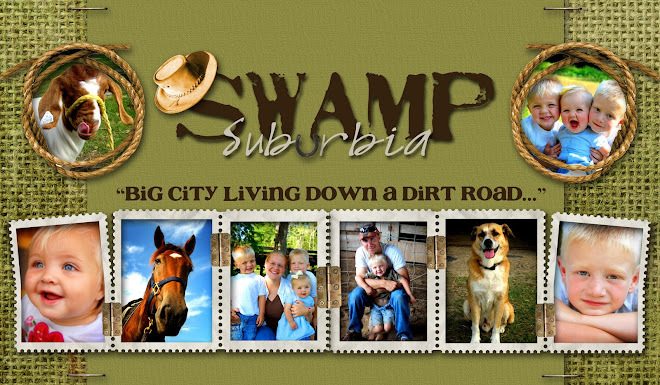 A new blog to love!! Thanks for leaving a comment! :) How did you find me? I'm always so curious how we end up on each other's blogs. Love "Big cowpoke" and "Little Cowpoke." Great names. I love the Jockey Lot. A lot. Wonder how cheap things would be if I figured in gas money to get there? That big pot by the front door is Da Bomb. Seriously. And the chipped paint shelf thingy rawks. I'm thrilled for you. And seriously jealous. Flea Markets ROCK. We have one here that is only about 6 or 7 miles from home, and it used to be totally awesome. However..... these days, if you dont speak Spanish, you wont get much there... 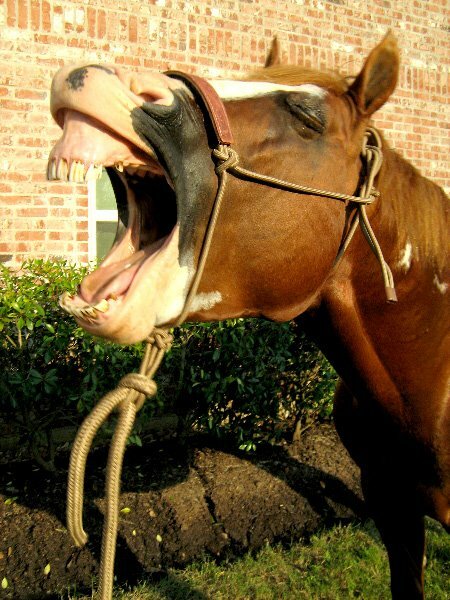 I hear there is a new one about 45 mins away, but I cant seem to get there, darnit! 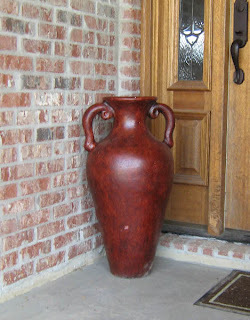 Love the big pot by the door- it looks fantastic! You got some good deals there! Sigh. Flea markets. I love them too and don't get to go near often enough. wish I could have gone when we were there! Now this is my kind of shopping. Where do you live again? 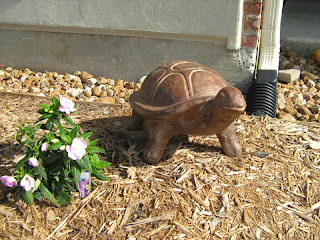 I LOVE that turtle and those pots! 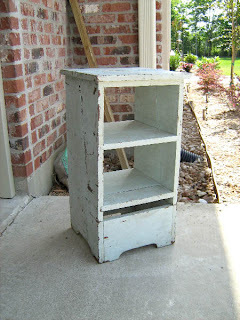 Love the flea market treasures! I used to get a lot of antiques and shabby chic things at the sunday market around here...but I haven't been in ages. Maybe it's time to go back and look for cowgirl stuff! You must have taken a BIG vehicle to get all the stuff home. Oh, and I took a few pics while driving once, too. I felt really stupid, holding the camera out to the window. I had no idea it would actually work, but it did. OH, I love Mr. 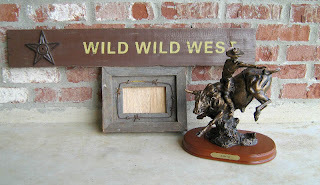 Cowboy's father's day sculpture. That is just the coolest! I found a western decor store near my parents' place....I hope it stays in business, my mom and I sure help keep them well-funded, lol! Oh I have to stay away from flea markets! I love them toooo much! Of all your finds I like the barrel the best!